elete/Citrilyte Add-In | Mineral Resources International Inc. Enjoy the original pure elete Electrolyte Add-in. elete is designed without sugars, flavorings, or anything artificial. elete can easily be added to any beverage (or food). Make functional electrolyte water that tastes like water. 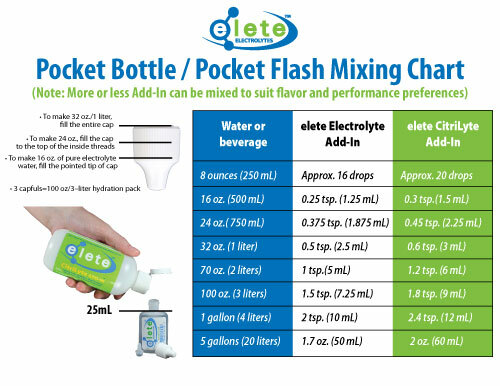 Think of elete add-in as your blank slate, portable electrolyte system to add electrolytes to any food or beverage. At full concentration, elete Electrolyte Add-In tastes very salty, but when mixed with purified water or other beverage as directed, elete adds little or no noticeable flavor.elete CitriLyte Add-In is a liquid electrolyte concentrate made with sodium, potassium, magnesium and chloride plus zinc, a trace element and citric acid. elete CitriLyte Add-In adds a slightly tart flavor. Either elete add-in can be added to water, gels, flavored beverages, diluted sports drinks, protein drinks or regular food. The pocket bottle is a handy refillable flask and measuring tool that allows you to take and mix electrolytes anywhere you go. The bottles provide a great value, making sufficient, ongoing electrolyte replenishment affordable. • Clinically shown to hydrate better than water. In a published, peer-reviewed clinical study, those who drank plain water drank 74% more water to achieve the same level of hydration as those who drank water with elete. • elete Electrolyte Add-In is a natural electrolyte concentrate containing magnesium, potassium, sodium, chloride and sulfate. • Safe for athletes. Free from WADA (World Anti-Doping Agency)-banned substances (original elete)View and download the elete/citriLyte flyer.